Here's some food for thought: why have a baby when you can have a unicorn? We know! We just blew your mind, didn't we? Babies are great and all, but having a little unicorn scooting across your floor is said to be the highest mark of good luck. And while babies are known for their (unintentional, yet undeniable) destructive qualities, unicorns are the healers of the magical world! Plus...come on! Look how cute your littlest one looks in this Infant's Pink Unicorn Costume. It's practically unfair. We want a unicorn of our own, now. Of course, we're not saying your baby isn't special, but having them associated with the likes of a unicorn will help everyone else see just how rare they truly are. After all, unicorns are the stuff of hushed legend, magical mystery, and mystic murmurs of sightings and encounters—turning your babe into a unicorn will make them the most exciting bundle of joy on the block! 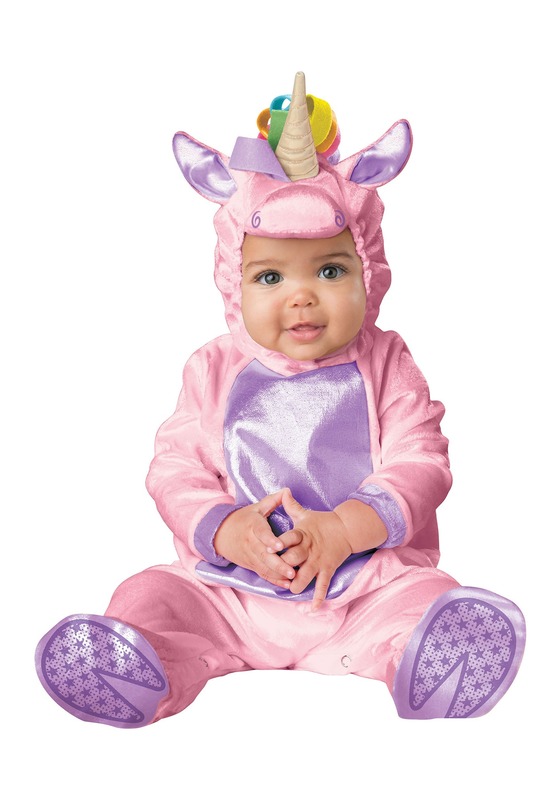 This is a cozy costume fit for a...well...unicorn, of course! It's a cuddly, iridescent pink bodysuit with inner leg snaps for quick changes. Shimmery purple patches accent the belly, booties, and cuffs, and (adorable) ears! The top of the hood holds a sweet, stuffed unicorn horn (can't forget that!) and a rainbow bow. If you thought your kiddo was cute before they were a unicorn, well, you're in for a real treat; now, they are downright darling as they crawl, giggle, and magically steal your heart away in this outfit! Your little babe will have so much fun prancing around town as a beloved pink unicorn that we wouldn't be surprised if you find them completely conked out, and ready to sleep through the night. Yes, ALL night long! Talk about a magical, rare, and beautiful sight to behold.